The idea of this project was to build a trackuino board with small gps module, low power arduino pro mini (3.3v @8mhz), a VHF transceiver DRA818V, and power management integrated. µC: The Arduino pro mini is intentionally clocked to 8mhz to ensure a less power consumption. Trackuino code was modified to send data to the VHF module, a resistors divider provide voltage batterie monitoring, and a LM60, the global board temperature. PTT on pin 10, Wakup/Sleep mode control on pin 11, and APRS audio modulation, pin 9, with a capacitor link and adjustable resistor (100k). GPS: is a 4D Systems | GPS-PA6B (16x16mm! 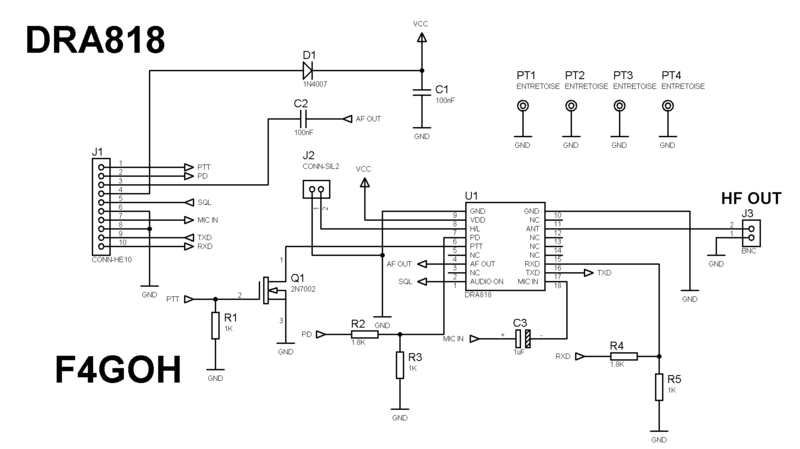 ), Enable pin is wired to a MOSFET, for a futur power management control function (pin 2 of Arduino). Radio: Ensured by a Chinese TRX DRA818V VHF module, power output is selectable between 500mw/1W, the module is drives by a UART communication bus on pin 7/12 from Arduino. also, he provide a Power saving control mode. I have put a low pass filter from minicircuit to avoid spurious modulation, the antenna is a 169Mhz version from Lextronic on a SMA connector. All of component are powered under 3.7v. Dimension are 80x56mm. Weight 78g. 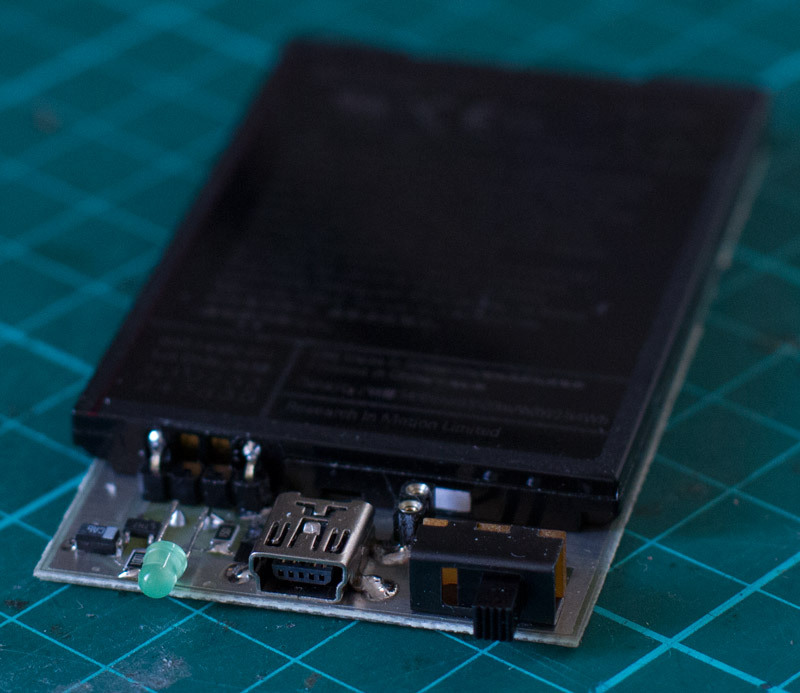 Power: A batteries from smartphone provide 3.7v@1450Mah, and can be charged with a dedicated chip, LTC4054. Trackuino modified source code can be download here. Schematic is here. Fell free to improve it. If you are a licensed radio amateur you can use this @30db power on VHF APRS band 144.800, 144.390. If you are not, the ISM European 169mhz is open @27db max power output with 1% duty-cycle without licence. Be carreful to respect your local laws. excellent do you have any fritzing schetc? Also if you are transimiting something in this specific frequensy , everybody in this freq can listen your data? TX and RX and TX send Long,Lat. and only the specific RX wants to get those data ? can this be done , or you have to make some kind of encryption between those Server and Client machines? – NO, no needed in fact. Also if you are transmitting something in this specific frequency , everybody in this freq can listen your data? what if someone got two of these modules TX and RX and TX send Long,Lat. and only the specific RX wants to get those data ? can this be done , or you have to make some kind of encryption between those Server and Client machines? The amateur license in the US which is required to transmit in the 2 meter band (144 MHz) forbids encryption. The FCC has been so far unwilling to bend on that though a number of amateurs have made requests to add encryption to the rules for VHF/UHF. Hello. What is the version of arduino IDE you use ? Code need to be compiled with v1 if i remember. I will check when i back to home next week. I’m interested in using your project for HAB research. I was wondering if you have a more comprehensive parts list. More specifically, where did you purchase your optocoupler and what diodes are you using? which version of 1.x have you used? hello, i use an generic optocoupler because i have experienced problems with the dra818v module (the magic of Chinese’s products), some people use resistor divider like =>, https://hamprojects.files.wordpress.com/2015/07/dra818.png , for PD pin, to drive PTT pin i use 2N7002 transistor. also in any case check the level needed into the datasheet. What do you mean generic optocoupler? If I were to buy one from mouser, what type of requirements do I need? Sorry to be so lame, but I’m new at this. Why not use LORA network ? Currently many stations placed in EU. I’m planning to use this project as a starting point to something bigger. 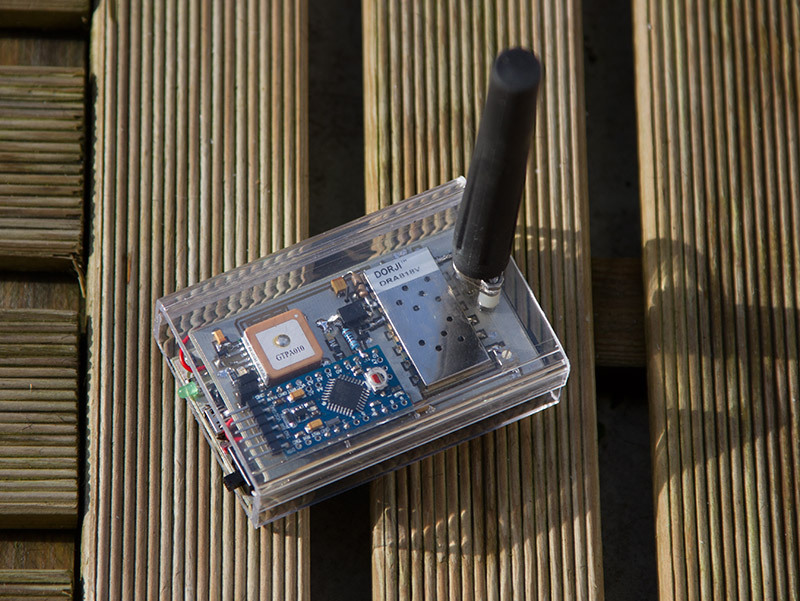 Similar to what has been posted on the ARRL website, I’m going to try and sort out how to use the APRS system to remote control a small robotic platform by sending commands to it as “One-liner” messages. Obviously, I haven’t yet worked out what needs to be changed in the code for this tracker to recognize those one line messages and interpret them as commands. Do you have any ideas there? If you are still actively working on this project, perhaps we can exchange email on the subject? Thanks for this informative post. I am currently also trying to learn about the DRA818V module, and using it in combination with a 3.3V Atmega microcontroller. There are a few points that I currently don’t understand – which isn’t that surprising, given that I am pretty much a novice in this field. Perhaps you, or someone else who comes across this comment could try to explain. This would be greatly apprechiated! * the passives between the audio pin and the microphone input: at the end the voltage should be about 100 mV peak-to-peak for the radio, am I right? What values (or ratios) did you end up using for your 100kOhm trimpot at the end? I have also seem designs where the coupling capacitor is at the other end, right at the microphone in. Does this make a difference? – to switch to “Transmitting” mode, Tx, you just need to put PTT pin to ground, by default if you leave this pin floated, the DRA818 will be in RX mode. – for your last question is depending of kind of modulation or bandwidth desired, i have used a 100k to adjust as better the quality of modulation. keep in mind it’s a very cheap TRX, and after testing a lot of , its not the same quality for all product, (as always with Chinese and cheap product). Is it possible connect audio output from pin 3 DRA818V to my small Raspberry PI with USB sound card to decode APRS frames when TX not transmit using your solution ??? I don’t have LM60 sensor but I have very popular sensor DS18B20. Can I use this sensor instead LM60 without modify code ?? Sadly no. Lm60 is a analog sensor. Ds18b20 use 1-wire connection (digital output). Thanks for important for me information. I have collected all parts and start with build your construction. I will be use TMP36 instead LM60 and I will be use opto-coupler 4N25. But I have review your schematic and photo I have see that you are use 2 resistors with PC817. What kind/ value resistors your are use ? Resistor R1 is 0 ohm or you wrote that 0 ohm is between Vcc and 5 PIN 4N25 ?? R2 is pulldown (1 to 10 kom) ??? if you take your schematic, in my case, R1 is 1K btw pin 11 and optocoupler (diode), and Vcc to optocoupler is 0 ohm (transistor). I have made to my electronic parts , I have different module GPS and sensor and optocoupler. It is all OK ??? 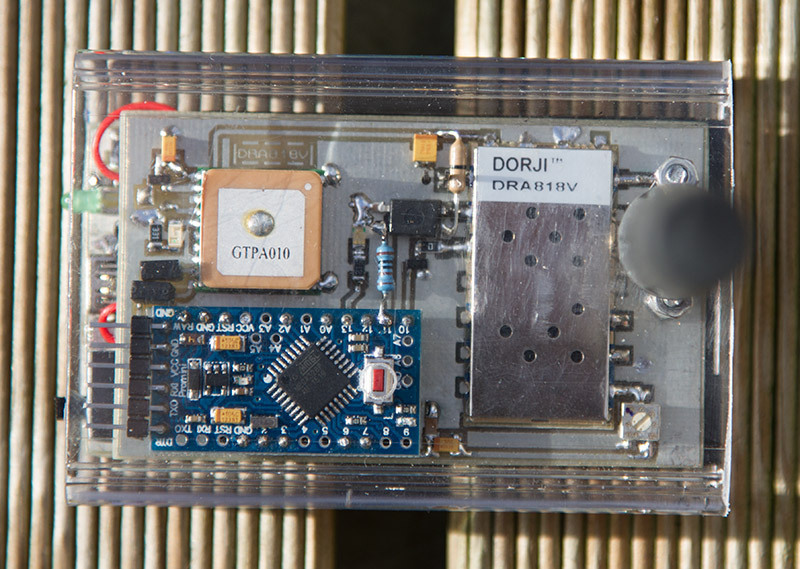 you can use what you want of GPS module, just ensure you use the good baud-rate. you can connect the opto directly to Vcc, in my case i use 0 ohm resistor to Vcc because it was a strap. Hey so i want to know which diode are you using ? I’m upload the code my Arduino Nano. Before I upload checked the code with Arduino IDE, don’t give error or warning message. When uploaded not error massege. It does not do anything. I connected one LED to PTT and one to GPS power port. The LED lighting on inmediately When finished program upload or press reset button on the Arduino. The RX LED flicking on Arduino when GPS modul send GGA messages. The link http://www.f4huy.fr/wp-content/uploads/2016/01/DRA818V_Trackuino.PNG is broken. Do you have the schematic in another address? How do you set the transmit frequency? Thank you, I missed it in the main code. I thought it might be in the radio lib. or the config. A very nice project, I have it working hard wired to my Igate now to make the radio module transmit. I would like the transmitter only transmit 20 or so mw, Guess I need to go inside the module and see what’s there. I made a couple of these but could never make them work right. The unit transmits APRS to my radio but the range is LOUSY (a couple of feet!!). I suspect there is a problem with the DRA818V module. I got mine from ebay from some China vendor. Perhaps they were selling modules that were not working right. Another one of the units I can barely hear the APRS on the radio.